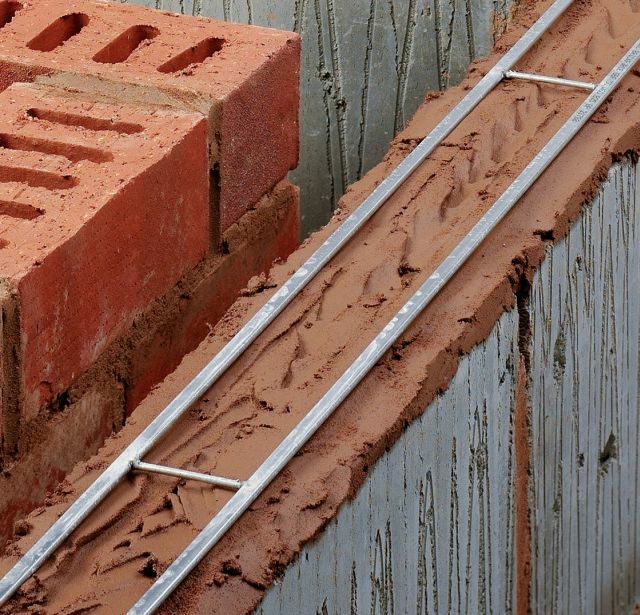 Brickforce® is designed for structural reinforced masonry applications and consists of two main parallel wires joined by in-line welded cross wires. It adds strength to help wall panels cope with lateral wind loads, allowing the designer more flexibility and the bricklayer an easier product to handle and position. The main wires are manufactured into a flattened profile to enable the product to be easily located into a mortar joint without steel build-up problems at lap positions and corners/ junctions, or when used in conjunction with wall ties. Brickforce® is available in a range of different wire diameters for specific structural loading situations and in a variety of product widths to suit different block or brick leaf construction. Brickforce complies fully with the requirements of the Reinforced Masonry Design Codes, BS 5628-2 and the Euro Code EC6 having CE certification to BS EN 845-3. Stainless steel Brickforce® packs contain 20 strips (54 m per pack). Galvanized Brickforce® packs contain 25 strips (67.5 m per pack). Insert code SBF or GBF, plus wire diameter and product width in mm, e.g. SBF35W60 or GBF40W100. 60 mm: Suitable for 102 mm brick or 100 mm block wall thickness. 100 mm: Suitable for 140 mm block wall thickness. 150 mm: Suitable for 190/ 200 mm block wall thickness. 175 mm: Suitable for 215 mm block wall thickness.